Chip Somodevilla/Getty ImagesJose Altuve of the Houston Astros stares down President Donald Trump during the team’s visit to the White House on Monday. The Houston Astros visited the White House on Monday to celebrate their World Series victory and meet President Donald Trump. American League MVP Jose Altuve attended – but didn’t look particularly happy to be there. He drew attention for appearing to glare at Trump for most of the visit. Two other players, Carlos Correa and Carlos Beltran, elected to skip the trip altogether. The Houston Astros went to the White House on Monday to celebrate their World Series victory, producing some memorable images of players interacting with President Donald Trump. Perhaps most notable was the American League MVP and World Series superstar Jose Altuve. 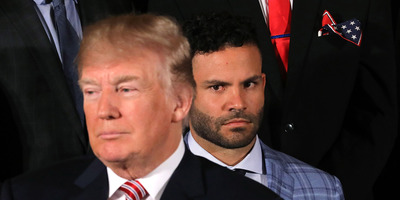 While he’s one of the most photogenic athletes you’ll find, Altuve didn’t look particularly happy to be at the White House, maintaining the steely glare you see above for most of the time Trump spoke about the team. The most cringeworthy moment of the day came when Trump called out Altuve by name, leading to an awkward handshake and a joke about the Silver Slugger-winning second baseman’s size. Altuve kept glaring when the Astros’ manager, A.J. Hinch, went to speak. Though White House visits for championship-winning teams have long been a tradition, they have become increasingly politicized since Trump took office. At least two teams have skipped the trip altogether, as the Golden State Warriors and North Carolina Tar Heels both elected to do after winning titles last year. Meanwhile, some players have opted out of the opportunity, either to protest or because of unspecified reasons. The Astros’ visit on Monday featured more of the same. Carlos Correa and Carlos Beltran both chose to skip the event, though Beltran said his absence wasn’t directly related to Trump. It probably won’t be the last contentious White House visit of Trump’s presidency. The Philadelphia Eagles are most likely next on the schedule, but already, numerous players have said they plan to skip it in protest of Trump.